Chad's army has driven Boko Haram militants out of Malumfatori town in north-eastern Nigeria, a senior official from Niger has told the BBC. 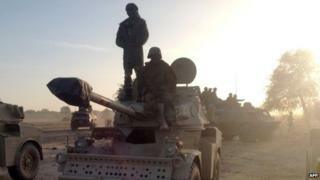 The reported capture of the town, which lies near the borders of Chad and Niger, follows two days of fighting. Both ground and air forces are reported to have been used in the assault. Niger officials said Chadian ground forces moved into the town after crossing Lake Chad. It is not known if the operation was approved by Nigeria. Boko Haram insurgents have carried out a number of cross-border attacks on Nigeria's neighbours in recent months, attacking villages and military bases. The Islamist group has seized dozens of people and taken them back to north-east Nigeria, where it controls a swathe of territory. The Nigerian authorities say they are doing all they can to tackle the militants but neighbours, including Niger and Cameroon, have said more must be done. Chad has already sent troops to Cameroon to help it counter Boko Haram incursions and last week Nigeria said the Chadian army would be fighting on its territory. However, it was not immediately clear if the authorities in Abuja had prior knowledge of, or any role in, the operation in Malumfatori. People who fled the area told the BBC they had seen military planes bombing the town, which is on the shores of Lake Chad. Some of those who left the town during the fighting are reported to have crossed into Niger. Meanwhile, reports from the area say fighting has now spread to a nearby town, Abadam. Nigerian officials have made little public comment. They said they were investigating the reports of fighting in the north-east. Aviation Minister Osita Chidoka told the BBC that Nigeria "has to redefine its fault lines in fighting" Boko Haram. He said tackling the group required not just military action but also "improving the capacity of the Nigerian state" in areas such as the judiciary, prison system and law enforcement agencies. "A lot will be done about Boko Haram beyond fighting them in the north-east part of the country," he said. African Union heads of state are due to discuss the crisis over Boko Haram at their summit beginning on Friday. Ghanaian President John Mahama has said the leaders must produce a "specific plan of action" to "deal permanently" with Boko Haram. Thousands have died and many more have been displaced because of the group's six-year insurgency.